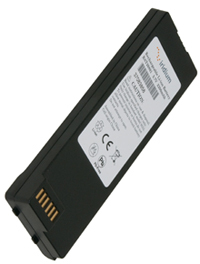 This High Capacity Iridium Extreme Li-Ion rechargeable battery can be very handy if the main battery gets discharged or damaged. It provides Iridium Extreme users with up to 6.5 hours of talk time and up to 43 hours of standby time in full network coverage. Battery Life Disclaimer: Battery life estimates are based on laboratory testing. Actual battery life may vary depending on use conditions. All batteries may cause serious injury or property damage, particularly if handled improperly or used after damage. Improper treatment or use of batteries may present a danger of fire, explosion, leakage, or other hazard. See Iridium phone user's manual for additional Warnings and Safety Guidelines.